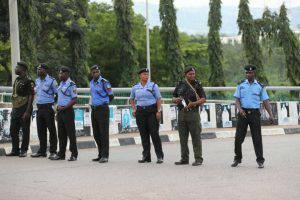 Emerging external report reaching Post-Nigeria, indicates that six Presidential Aspirants under the platform of the Peoples Democratic Party, PDP, alongside the PDP National Chairman, Uche Secondus, were teargassed by men suspected to be the Nigeria Police, during a peaceful protest against the partiality of the nation’s Electoral body, the Independent National Electoral Commission, INEC, and the Police. 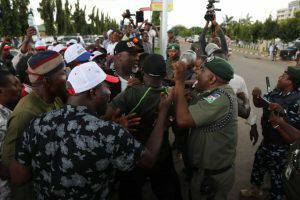 The protesters, which included PDP Presidential Aspirants, Senate President, Dr. Abubakar Bukola Saraki; Governor of Sokoto State, Aminu Tambuwal; former Governor of Jigawa State, Sule Lamido; and Senator Datti Baba-Ahmed; had left the INEC Headquarters, and were approaching the Police Headquarters on a peaceful protest, where they were met with Police barricades, and live ammunition. 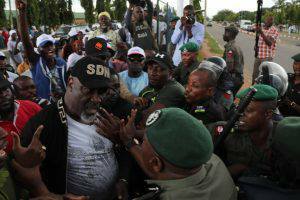 Senator Dino Melaye, the Chairman of the PDP Committee, to protest the Osun State Gubernatorial election, was also physically assaulted by two Police Officers, allegedly.